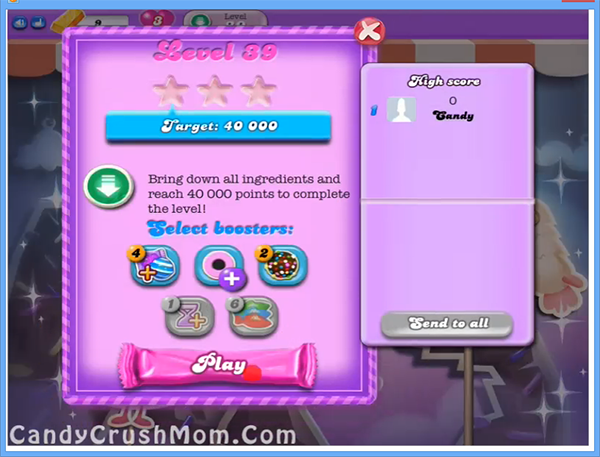 This is hard level with ingredients requirement and you need to bring it down from big 79 candy board with 8 grill box and it could make problem. First you need to break grill boxes as much as you can so later any ingredient wont struck on it and then try to increase moon power by breaking candies that the Odus owl have. As moon will have full power it will struck and will break same color candies that will give more chance to make special candies like colorbomb and others. You should try to make colorbomb by matching five same color candies and striped candy by matching four same color candies and then try to combine with each other to break more candies. If you can’t make this combination then use other special moves that you will need to take down all ingredients within 35 moves without loosing Owl balance. We completed this level with 84520 score by making more special candies and completed within 31 moves and remaining moves converted to striped candy.